Myanmar – a cultural mecca recently relieved of military junta a mere 7 years ago, some of you may know it formerly as Burma. Nestled in between Thailand, Laos, India, Bangladesh, China, and along the Bay of Bengal. With a population of 55 million people, and 90% of them being Buddhist, it leaves a mark on every sphere of life. In addition, almost 100% of the population are extremely joyful and friendly people. 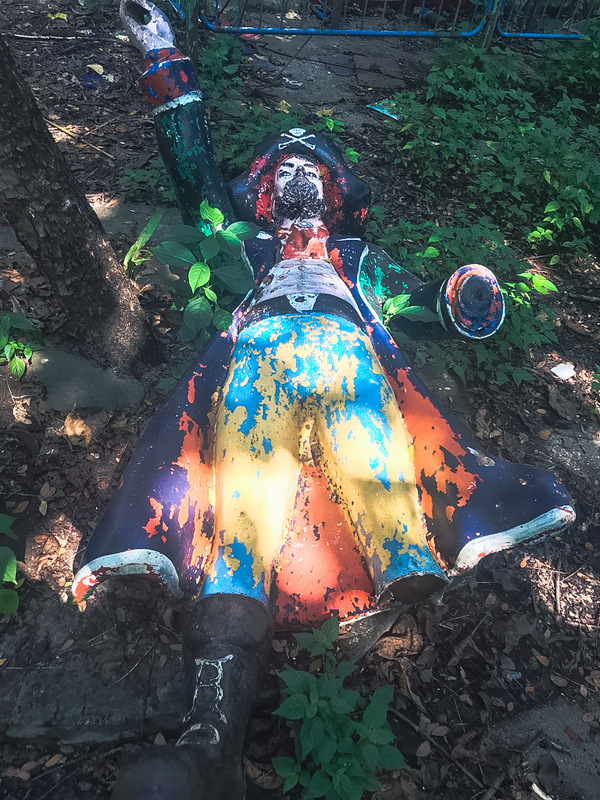 This country is second in the world after Afghanistan for the illegal opium production, but this has nothing to do with the previous sentence…but we’ll get into more of that later, when we write an article on Myanmar as a whole. Since being removed as the capital of Myanmar in 2006 and replaced by a more modern city (Nyapyitaw), it still remains the largest city in the country. All-in-all British colonialists did a good job leaving behind streets full of beautifully designed colonial buildings, which, however, are slowly fading, with trees and grass growing from the roof and cracks. On the whole, this is a rather large Asian city: With street vendors, people sleeping on the side of the road, chaotic road crossing, and stray dogs around every corner. It’s a good thing that the city is exceptionally green, and that motorbikes and scooters are banned, allowing the air to feel quite fresh here. Both men and women wear traditional longyi (long fabric tied in a knot around the waist resembling a skirt) with t-shirts covering their shoulders. Inna was the only person wearing a top with her back exposed. The Sule Pagoda – an octagonal 44 meter pagoda located in the center of Yangon and surrounded by busy streets, a market and colonial era buildings like the Supreme court building and Yangon city hall. 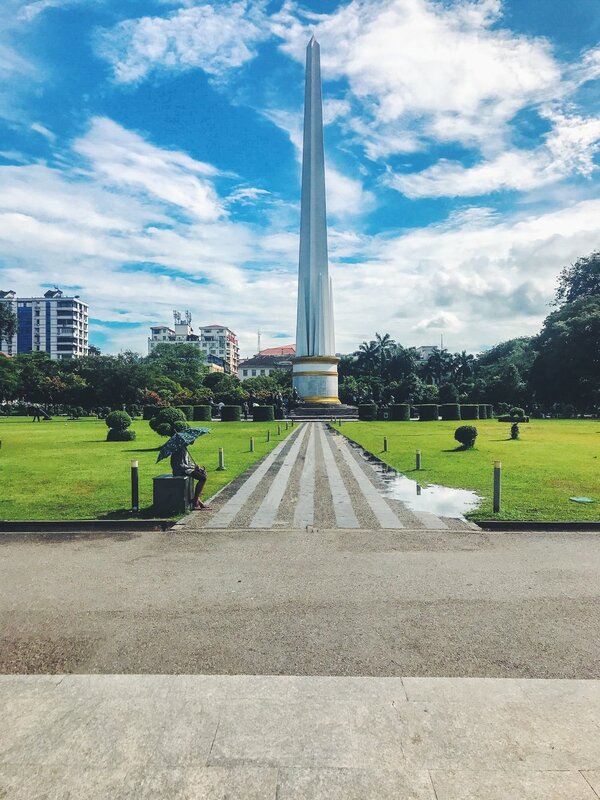 Independence Monument - an obelisk in commemoration of Burmese independence from the British in 1948 that is located beautifully in the center of Maha Bandula Park and just another 5-minute walk to the river and Pansodan Ferry. Shwedagon Pagoda – is the most sacred Buddhist pagoda in Myanmar. It’s height is 326 feet (99 m) and the gold seen on the stupa is made of genuine gold plates, covering the brick structure. The crown on top is tipped with 5,448 diamonds and 2,317 rubies. Don’t forget to be covered on shoulders and knees as you’ll have to rent the lungi garbs. But the deposit for rent is returned in full, so if you wanna try on some traditional clothes, it can be a way to go. The entrance ticket is 10.000 kyat that gives you an access not only to the Gold Pagoda but also to the huge area with temples surrounding it. Note: Don’t get scammed for the 1000 kyat plastic bags on the outside of the temple as they’ll tell you that you need them for your shoes. 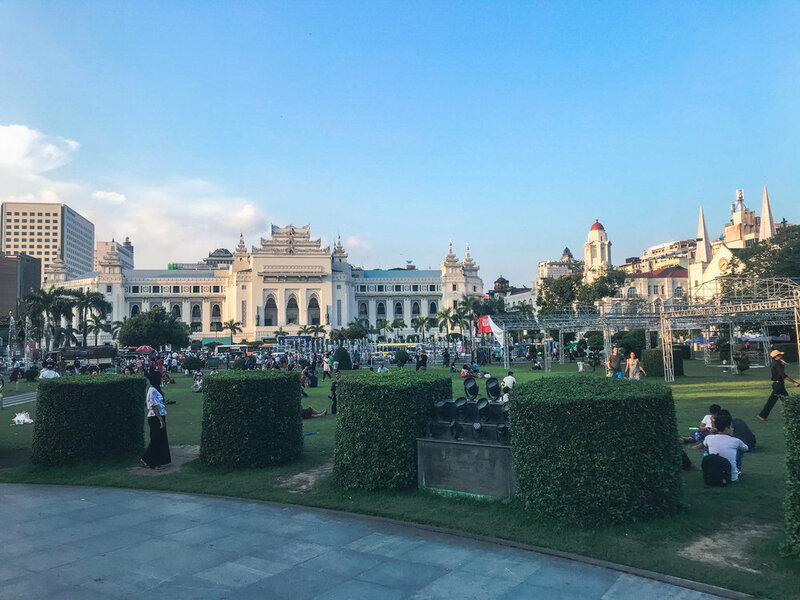 People's Square and Park is one of the major parks surrounding the Shwedagon Pagoda. If you are looking for a quiet, peaceful and green corner in the hectic dusty city, it’s the place! The park is very well-tended with over a thousand trees and plants from 52 species making up the square. During a 3-hour expedition spanning through all different parts of Yangon, we were surrounded by about 10 other tourists on our car. Followed by many many more locals who got on and off each stop selling all different types of goods ranging from watermelon, oranges, tea leaves, headphones, waters, and even reading glasses. It’s a three-hour journey at a snail’s pace, which on the other hand allows you to take amazing pictures and explore the life of locals from your window. You can always exit the train at any stop and grab a taxi to your next destination. The price for ride is only 200 kyat and you can buy the ticket on the Platform 7. 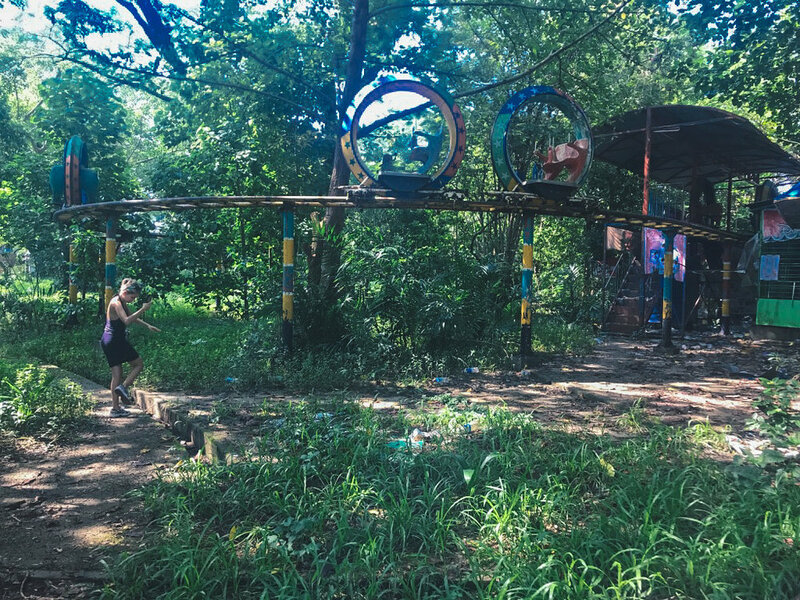 If you wanna go a little bit off the beaten path and like abandoned places, the following information is for you! 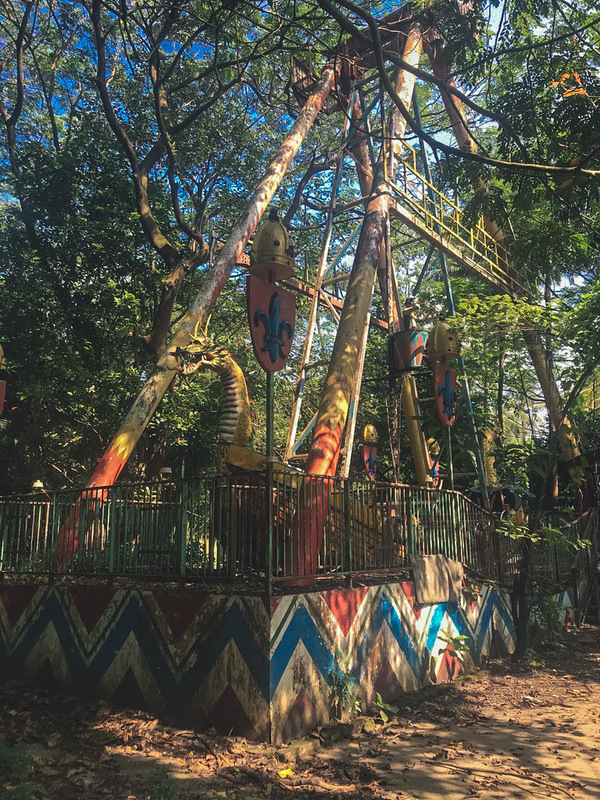 The amusement park was opened in 1997 during the time of Burmese dictatorship. It was shut down around 2012-2013 for uncertain reason, however, there is a theory that the director of the company failed to renew the lease. Now it lies tucked between the Zoo, local restaurants, and a Convention Center/Hotel. To find the entrance to it, you must go near the local restaurants and look for one of two holes in the fence. Try to arrive early morning as you won’t want to attract much attention to yourselves, just to be on the safe side. Note: We got chased for a little bit going through, we are not sure who it was to be honest as we didn’t want to find out. All we know is running through mud helped to lose them! Loads of mosquitoes inside, we even used mosquito spray and it didn’t help – apparently, they are so hungry that they don’t care. So just be prepared. We tried not to encounter any locals while being there, as we were not sure how they would react. When we were entering the park locals were giving us some suspicious looks so we decided to be careful. There were stray dogs inside, they seemed to be peaceful but who knows. Upon research, we read that some people write about snakes but we personally didn’t see any. Yet, we avoided walking on the grassy areas and kept to the paved ones. When choosing a hotel in the area we’d highly recommend not going too overboard with the spending. We were able to find very affordable places in the range of $15-$20 for a private double with our own bathroom and shower with breakfast included. We stayed at the East Hotel which is located right in the downtown in the vicinity of Sule pagoda. The room was not loud, had all the necessities, and complimentary bottled waters were available at any time. Staff speaks good English and helped us book our tickets to Bagan. Not going to lie our hotel had pretty good coffee that was included in our stay. Coffee Shops are within close proximity of hotels in this area such as Cafe amazon, Craft Coffee, Parisian Coffee, and many others. 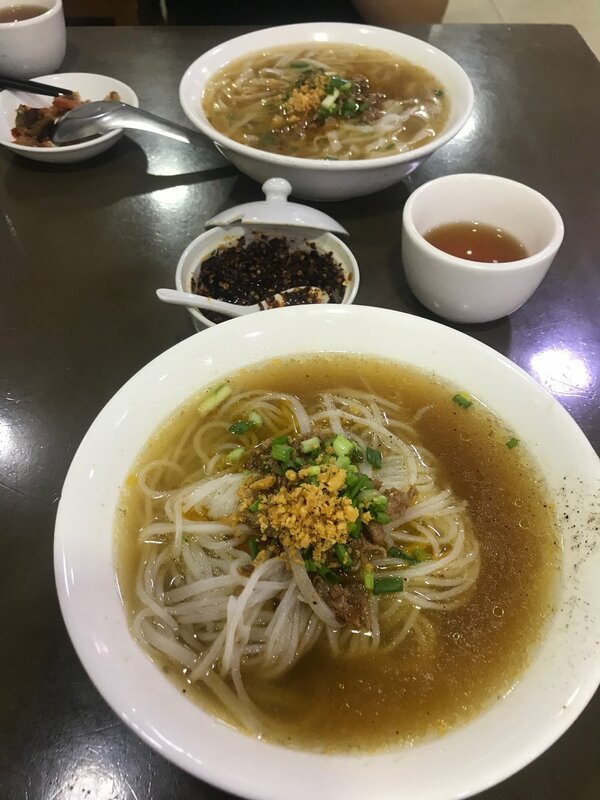 999 Shan Noodle House – a little cafe with cheap and delicious meals that come with free tea. Wide selection of different types of noodles, noodle soups, rice and veggies. Staff speaks English and the service is good. Average price for the meal is 2000-3000 kyat. 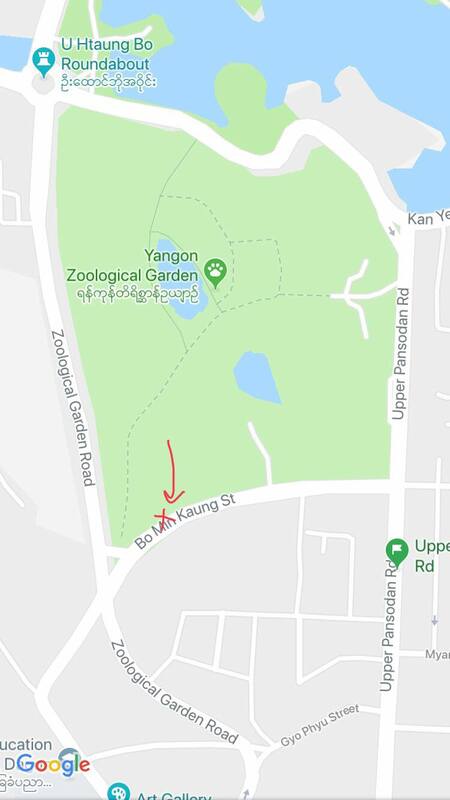 Street food behind Maha Bandula Park – some of the food there might seem a bit adventurous but you can definitely stay on the safe side and find noodles or rice for under 1000 kyat. Chinese food and street food in Chinatown - 19th street in Chinatown area is full of vendors who offer different types of grilled meat and skewers. Most of the items on skewers you should recognize, just about everything is pretty familiar – there’s pork, chicken, meatballs, tofu, ribs, squid, prawns, and then mushrooms, broccoli, carrots, asparagus, and plenty of other things too. Chinatown 125 Cafe - An upscale looking Chinese cafe with a variety of coffee types and delicious fresh juices. With a good barista downstairs and an above average English speaking staff, this cozy little cafe gets an A+ from us! Supermarkets - in Sule Plaza and in Junction City are western type supermarkets with wide selection of products. A bit on the pricey side compared to the rest of the places you can get groceries from, but if you’re looking for clean, convenient, and western name brands then this is your place. Alibaba - a modern arcade located near the Sule Pagoda. We only popped in here for a second to have fun and escape the torrential downpour outside, but we found ourselves having a blast playing the new walking dead arcade game. Very bright and bubbly atmosphere with a nice group of local people all cheerfully and happily playing their favorite games with one another. Movie theater - located on the top floor of Junction City, this theater offers a selection of films in English and in Burmese. You can select your seats on the screen and even get a couples couch together. Ooredoo Cellular Service - 6500 kyat for our sim card and 5gb of data. 5000 kyat for the data and 1500 for the sim card and registration. We found that it works all around Myanmar with no problems what so ever. Grab taxi app - one of our favorite things about getting from point A to point B in Asia. It’s the exact concept as Uber except it allows the user to pay cash in the end and also gives out rewards as well. Even better though is that it allows foreigners to order a car without having to negotiate a price or worry about getting ripped off.